9.5.2014. 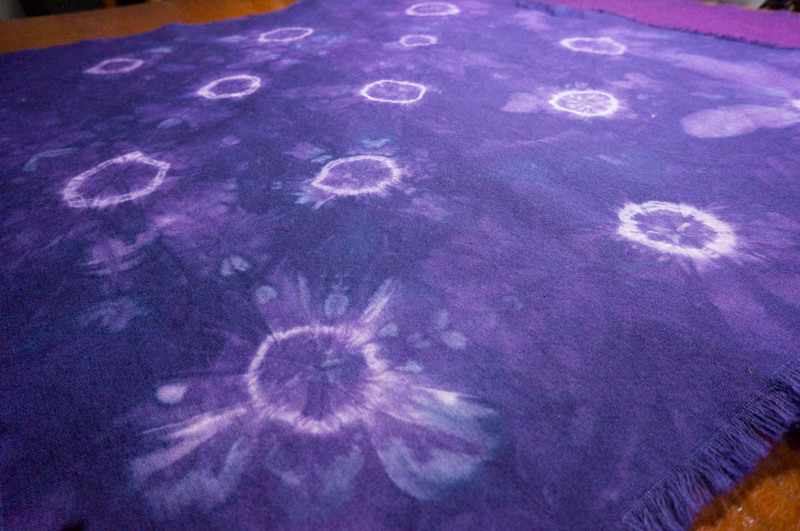 [Cont'd from 9.4.14] Dyeing cloth is like cooking. You can find dozens of recipes for, say, Irish soda bread -- the ingredients are roughly the same, but the proportions vary. There is no correct recipe, only the one you like best. And you collect your favorites. Realizing this has eased my frustration about finding the exact recipes for how much Procion MX dye to mix with a quart of solution. In the end, only experimentation will give me the shade of purple or red or green that my heart desires. And I better keep records. That said, I decided to make my four stitched pieces of fabric all the same color -- a muted purple (1 part fuschia + 1 part mixing blue). The other thing about Procion dyes is that (unlike the instant gratification of indigo) the cloth has to sit in the dye solution for at least 24 hours. Yesterday afternoon was the big reveal. The results are below. My conclusion: YES, careful stitching of the fabric yields a more consistent pattern across the whole expanse of cloth. It's hard to see all the subtleties on the photos below, but you'll get the idea. 1. Woodgrain (mokume) -- running stitches in rows through one layer. I think this is my favorite. 2. 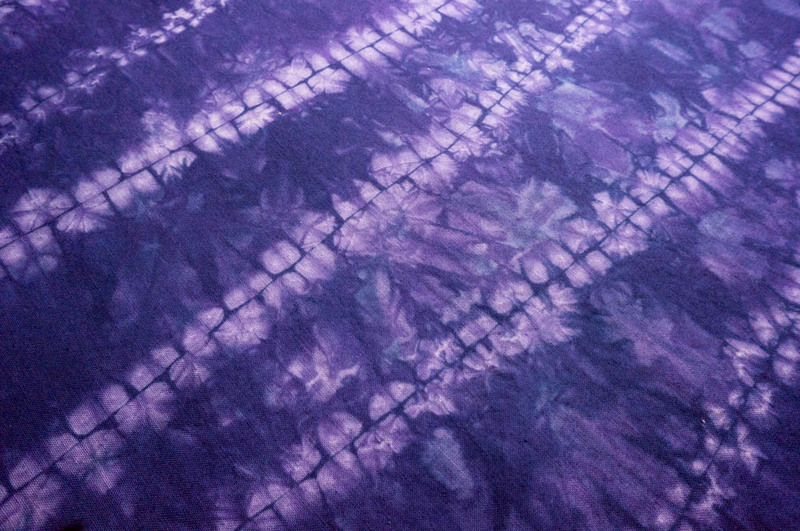 Ori-nui shibori -- running stitches made through two layers of pinched-together fabric. This turned out great too. Next time I might make the lines parallel (instead of skewed) or wavy as shown in the book. 3. Thread-resisted rings (ne-maki shibori) made with kamosage knots. This result was the least interesting to me. Rubber bands might have done as well. The most interesting designs were produced where my thread was wrapped less evenly. 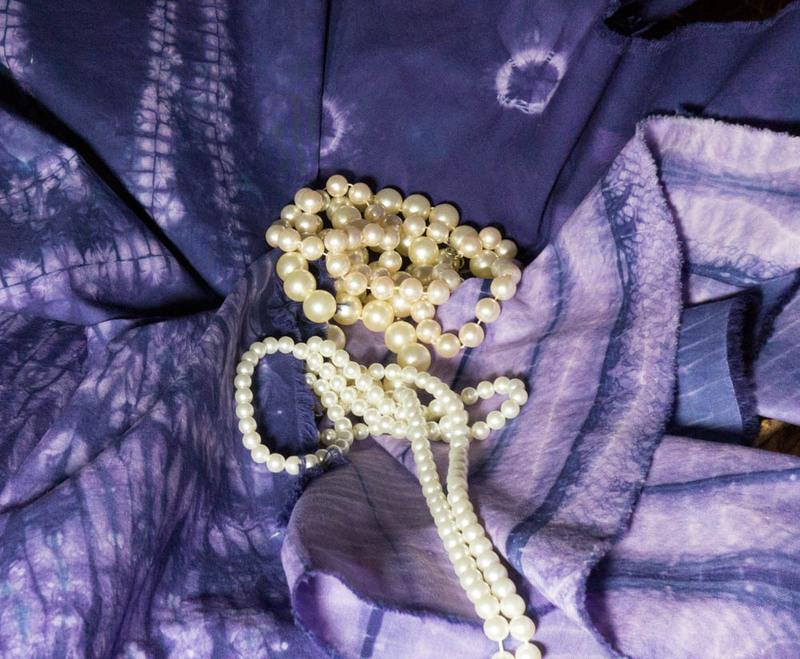 The thread itself leaves its texture behind, which is why I've seen shibori referred to as "memory cloth." 4. 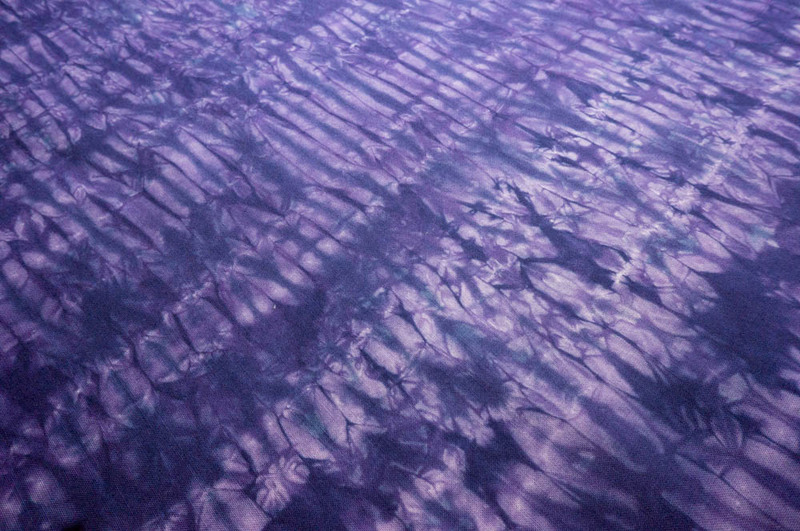 Nui yoro shibori -- narrow pleats, stitched together and pressed with starch, then wrapped around a thick cord and tied. 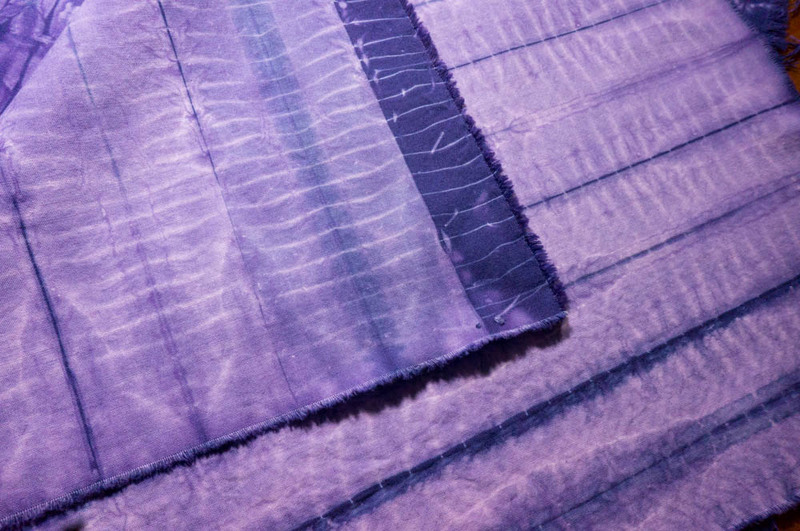 Tying my pleats around a cord limited the amount of dye that got through, so the "stripes" looked like purple bamboo against lilac. Interesting possibilities here I might build upon. Jim asked what I was going to make with all this luscious fabric coming out of my workshop. I have no idea. Maybe I'm just stocking up a summer's worth of fabric for a winter's worth of sewing.